The message we heard at worship tonight was about priorities. Priorities for living a life of faith. And what is the priority of this trip? To be with the church; to be with the church in a place where being the church is difficult. And that was our priority on this day. We spent the early part of the day with an old church, the Chaldean Catholic Church, born in the first century and still here in Basrah. They have a new archbishop whom we met today. Saidna Habib was born in Iraq north of Mosul and has returned here from years in Great Britain. He returned home out of obedience and joy to carry his cross in service to our Lord here in this hard place. In Basrah, as in other parts of Iraq, many of the Christians have left for safer places. Of six Chaldean churches, only two remain open. But sitting here with this man and his brothers in this ancient church, we heard him talk about their priority, which is to be a door of hope. Hope? Here? And the answer would be yes! They have three kindergartens with 900 children, 90% of whom are Muslim. These children learn to pray before meals and thank God who has provided their food. They return home after school and when their families sit down to eat they explain to their parents that first they must pray and thank God. An open door of hope. And those four closed churches? They have opened them to families with little money who need a place to live. An open door of hope. And then we moved with them into the sanctuary where four men who live their faith openly and honestly, not hiding it from those who might want to cause them harm, sang praises to God in an ancient language, Aramaic, the language of Jesus. An open door of hope, and we walked through it with them. 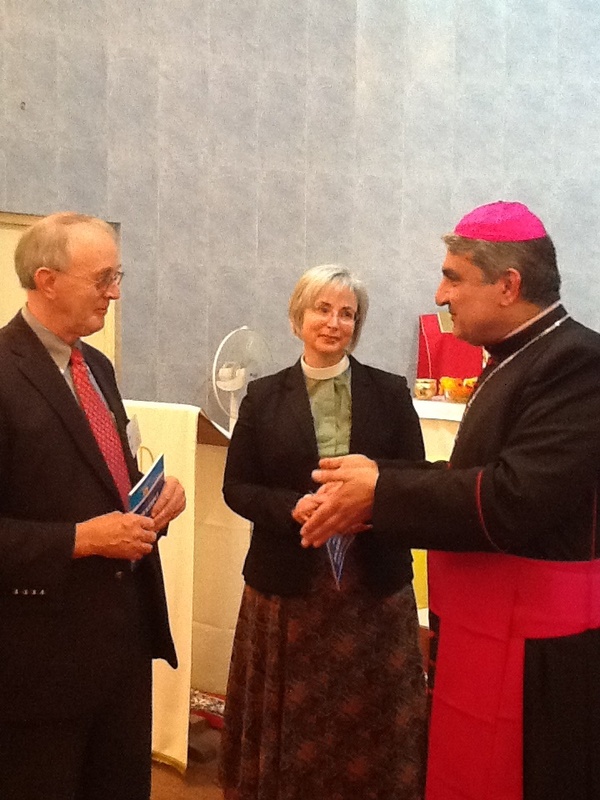 As we left the Chaldean church the priority of our Iraqi church family was to feed us. As always, a large part of being in this region is the sharing of food, literally, large quantities of food. We were served tea and sweets by the Chaldean archbishop, followed by lunch at a new Lebanese restaurant, where there was so much food on the table the staff had us move to clean tables for tea following the meal. In the evening after worship at the evangelical church, we were once again fed incredibly delicious homemade food. In the afternoon our team gathered before heading to worship for a time of devotion and prayer. Chuck Gosselink, who was born in Basrah while his parents served as missionaries, led the devotion ending with a prayer from his church's worship service last week. This prayer struck a chord in our hearts because it reflects our prayers for the Christians in this place. "Be present in our struggle, and help us to rest in your eternal promises, that we might be fed both with the bread of the world and the nourishment of your word, strong to resist temptation and faithful in our worship of you. Amen." As day turned to night, our team made its way to evening worship where Assis Magdy's sermon presented the priorities of our faith centered in these three questions: 1. What is on our inside? 2. Do we believe in things unseen? 3. Are we reconciled with others? These tenets of our faith presented in questions are priorities indeed. The Christians in Iraq, be they Evangelical, Chaldean Catholic, Seventh Day Adventist, Armemian Catholic or Syrian Catholic (whose priests and pastors attended worship with us tonight) know that living for Christ with Muslims and all others here is the priority of their call. May God bless their witness of open doors, charity and love.